Have you ever read a book that leads you to aha moment after aha moment? A book that is so clear and feels so incredibly right that you just want to ring up the author and invite her over for a cuppa and a damn good chat? 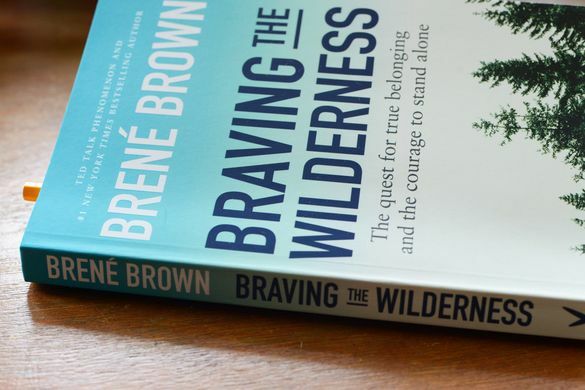 Well, Braving the Wilderness by Brene Brown is that book for me. I was in Cairns and I saw that my friend had a copy. Being a book fiend, I asked her if I could flick through it and she suggested I read it as she had just finished it. She had found the book very insightful and – knowing that I was a Brene Brown fan – thought I would enjoy it too. Enjoy it? I LOVED it! If this book was a chocolate cake I would have devoured it in one sitting!! Brene Brown PhD, LMSW is a research professor at the University of Houston. She has dedicated her working life to studying those emotions that make many of us feel uncomfortable – like courage, vulnerability, shame and empathy. She did a TED Talk on vulnerability in 2010 and it has been viewed almost 35 million times. This puts it in the top five most watched TED talks ever. This lady understands human emotions on the level of mastery! “True belonging is the spiritual practise of believing in and belonging to yourself so deeply that you can share your most authentic self with the world and find sacredness in both being a part of something and standing alone in the wilderness. True belonging doesn’t require you to change who you are, it requires you to be who you are”. Wow! True belonging requires you to be who you are! How powerful is that? In the world where there is constant comparison and many people feeling inadequate, the idea of just being our authentic selves seems like a bold suggestion. Brene’s analogy of that as being in the wilderness is incredibly beautiful. I mean the wilderness IS beautiful, it can just be damn scary though – especially when you are on your own out there. The wilderness can feel dangerous, there are bears (or in this country snakes and spiders) but the reality is the beauty of the wilderness always wins if we are prepared to just “be” in it. When I reflect back on the times I have been in the great outdoors, far away from the city lights and enjoying the silence that space like that offers, I feel a profound level of connection. This connection, I had always thought, was connection to something higher, God or the Universe, yet as I read this book, I came to realise that the connection was to myself (who is a part of God and the Universe anyway). The wilderness is really where freedom lives. Just like when I have been in the “wilderness” of standing in my beliefs in the face of criticism or ridicule. The times where I have left the relationship that was hurting me even though I was scared. This wilderness can seem far more terrifying yet, like the outdoors wilderness, this is where freedom lives. Freedom to be me and therefore truly and deeply belong to myself and to the greater world simultaneously. The thing about true belonging though is it is a combination of being in the wilderness, being you – even if it means you are alone out there, as well showing up, participating, sharing yourself and allowing yourself to be seen by the world around you. My experience is that we don’t really see each other anymore. People fleetingly glance in another person’s eyes but do they truly see them? I don’t think so. In fact there was a show on SBS called Look Me In The Eye that was about two people in an estranged relationship coming together. All they did was look into each other’s eyes for five minutes and then make the decision of whether or not they wanted to heal the relationship. Most of them did! People are hard to hate close up, so move in! Brene talks about the four elements of True Belonging, and this is the first element. This is exactly what the SBS show was about. It is extremely difficult to look into the eyes of someone you hate/dislike/have anger towards, for five minutes and there not be a shift. We are kinaesthetic beings, we feel other people’s pain if we connect to them. I am not going to share the other three elements. I want you to read the book. I hope that everyone reads the book, not only so you have a greater understanding of what the human spirit is craving but to appreciate your wholeness, even when you are out there in the wilderness all alone.